AWTT INC. Hexprotect® floating cover system (patented) is the result of intense and extensive reasearch leading to a product which fulfills demands of an affordable and wind resistant floating cover for liquids. The Hexprotect® hexagonal floating cover system ensures coverage of up to 99%. The resulting thermal insulation barrier combines the insulation factor of the air held in each tile with the poor heat conductivity of plastic. While the small air pockets between the tiles are not sealed, they also contribute to this insulation system, which dramatically reduces heat loss and light transfer. The cover also reduces liquid loss through evaporation and prevents odor problems. The Hexprotect® floating cover, contrary to standard covers, does not represent an obstacle to static, moving or dipping equipment. The tiles can be easily pushed aside and the cover reforms itself as the basin and obstacles change configuration, as in a clarifier. In fact, the tiles will keep up with liquid level, rising, lowering and restacking themselves as needed. The Hexprotect® floating covers are also an effective wildlife deterrent. When entirely covered, the body of water becomes unattractive to waterfowl and other wildlife such as deer. They simply don’t recognize it as water. Compared to netting, Hexprotect® floating covers are not sensitive to ice or snow damage and do not require any kind of support. 95-99% coverage insures large reduction of emissions. Aeration can be installed underneath the Hexprotect ™ system to ensure aerobic conditions are maintained. 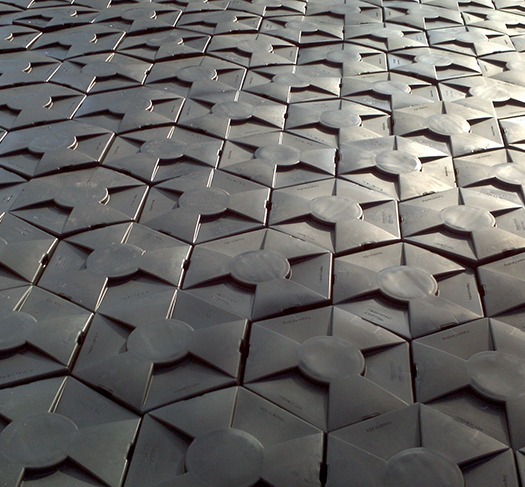 Hexprotect® tiles are made of virgin or recycled, high density polyethylene HDPE (FDA (3) and NSF approved HDPE resins available for special applications). The cover self ballasts, increasing its weight more than 260%, making it suitable for high wind applications. The proprietary features and manufacturing process ensures the cover floats with slightly more than 50% of its shell above water. 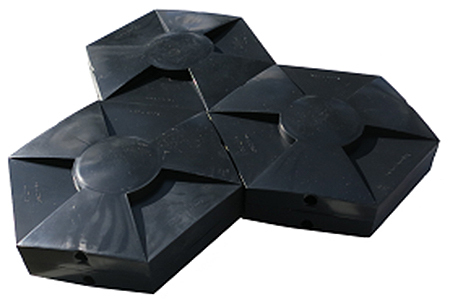 Compared to other hexagonal tile covers, the Hexprotect cover is often cheaper to ship and offers improved wind resistance. Installation remains extremely simple, and simply consists of unloading the product directly onto the liquid.